This weekend, 6,500 people took part in the biggest action of civil disobedience ever against lignite mining. Several thousand activists occupied the tracks of the Hambach coal train for over 24 hours, thus blocking the transport of lignite from the mines to the surrounding power plants. Some activists chained themselves to the tracks and thus prolonged the occupation until 4.30pm on Sunday. “Germany’s Coal Commission is desperately clinging to outdated energy technologies. It wants to sacrifice our future to the profits of corporations. We have shown with our action: They will not get away with it! The majority of the population wants to shut down coal-fired power plants immediately,” says Karolina Drzewo, spokesperson for Ende Gelände. 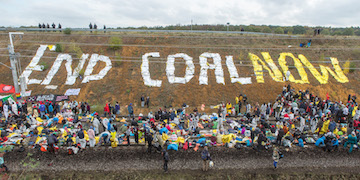 “Ende Gelände”, an alliance for coal phase-out, had been negotiating for weeks about an area for a protest camp. A first camp was evicted by the police in the middle of Wednesday night. A second camp was built shortly after, giving shelter to 4,500 activists. A total of 6,500 activists set off on Saturday to block lignite infrastructure around the Hambach open-pit mine to demand the immediate phase-out of coal. A small group occupied a coal excavator in the early morning of Saturday, which had to stop for several hours. 4,000 activists occupied the rail tracks of the Hambach Railway for more than 24 hours, thus blocking the supply of lignite to the surrounding power stations. Some activists chained themselves to the rails. In accordance with the group’s action consensus, the activists were peaceful throughout the action despite the police attempting to escalate the situation.